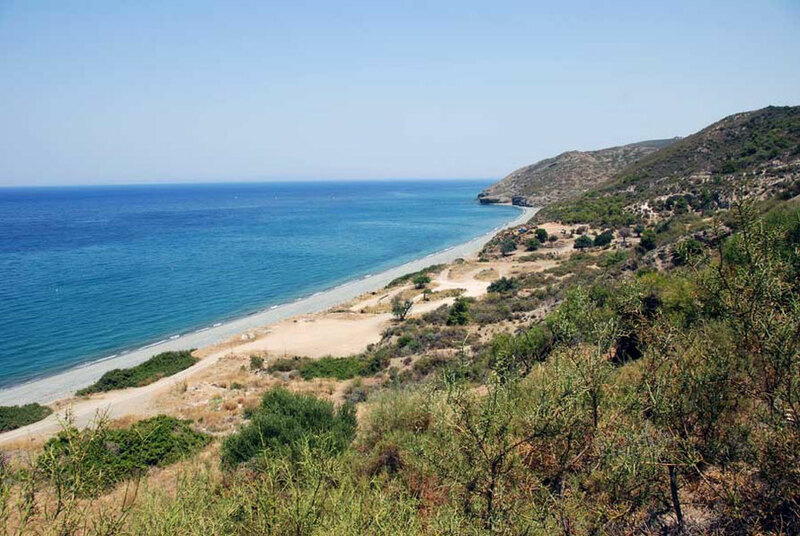 The road from Nicosia, in the centre right of Cyprus, to Kato Pyrgos on the north west coast is a tortured affair caused by the partition of the island. 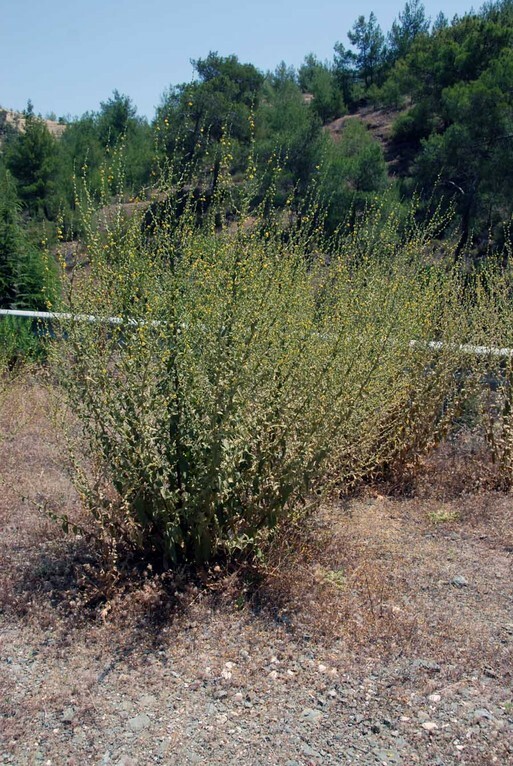 Initially it follows old routes at about 200m above sea-level that linked villages that bordered the flat plain of the Mesoria and benefitted from the winter rivers flowing northwards off the Troodos mountains. But once the Troodos move closer to the sea at Morfou Bay the road has to thread its way agonisingly slowly through the steep valleys that run down to the Green Line. After a long detour around the old international airport (now in the Buffer Zone) to the west of Nicosia the road initially travels across a flat plain that seers in the baking heat. The day I did it temperatures in Nicosia reached 42 degrees Centigrade. 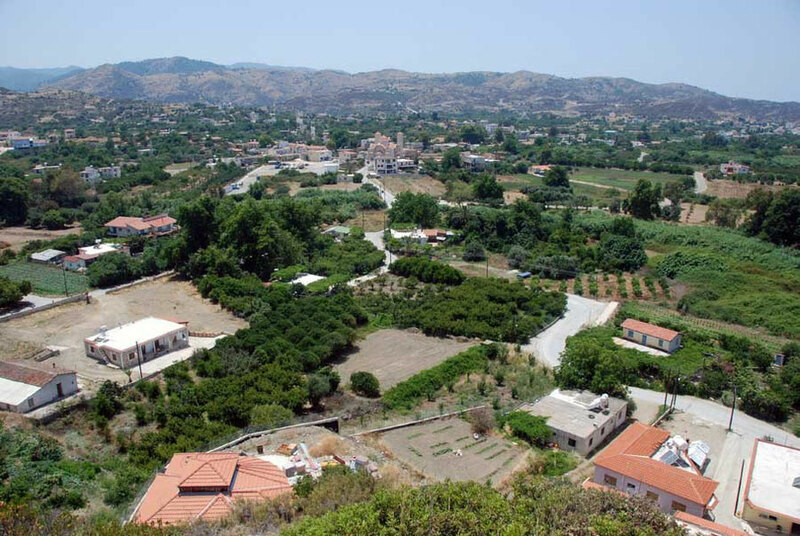 After leaving behind increasingly tatty suburbs the route passes through onion, garlic and water-melon fields before reaching Peristerona. The route then passes through Astromeritis where signs point to Morfou and the recently opened crossing to the North. Our waitress, who loves to go to Pyrgos for the fresher air and uncrowded beaches, said she didn't like to use the crossing because the Northern authorities issue unwarranted speeding and other tickets. I could have taken this option and then recrossed into the South at the recently opened crossing at Limnitis, just before Kato Pyrgos. But I was interested to see the mountain road and the Green Line. Driving through the pretty dishevelled streets of poor-looking Astromeritis I noticed graffiti on a very smartly renovated house that stood out like a sore thumb in the dusty street. 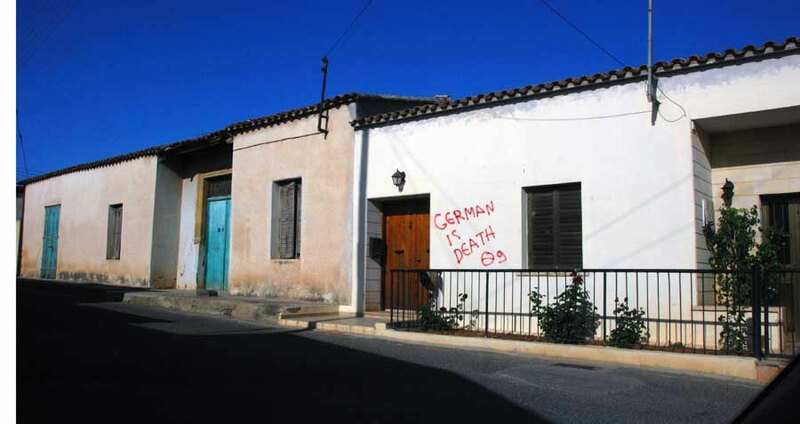 The graffiti said, 'German is death 09' which looked as if it were meant to say 'Death to Germans' or maybe it was a disgruntled language student or maybe there was a link with the EU bailout of Greece. And this was before Greece faced Germany in the Euro 2012 championship! 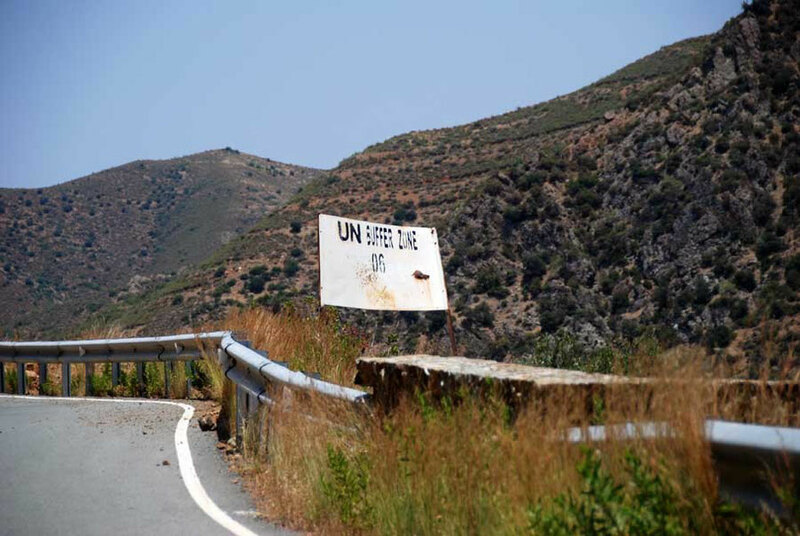 By this time I had seen an assortment of UNFICYP vehicles moving along the main road to Nicosia between different lookout posts: pickups, a van and a small bus. 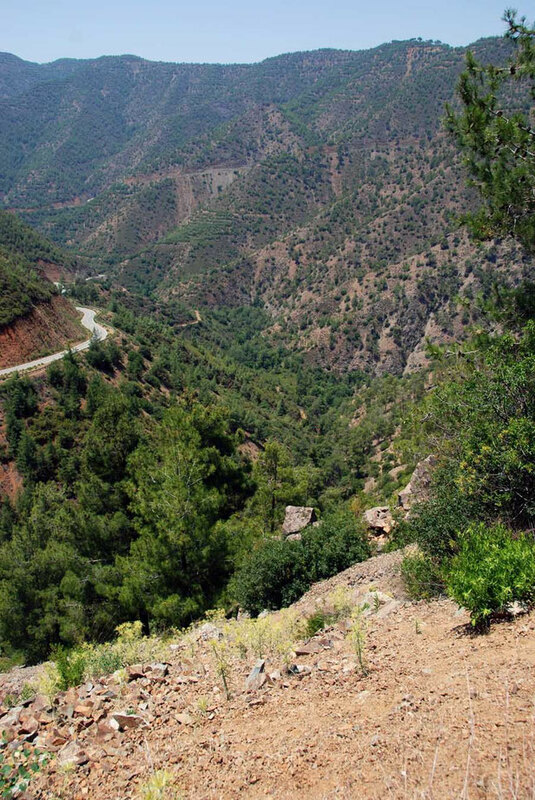 After the main road for the Troodos starts its run into the mountains the road to Pyrgos turns off to the right. 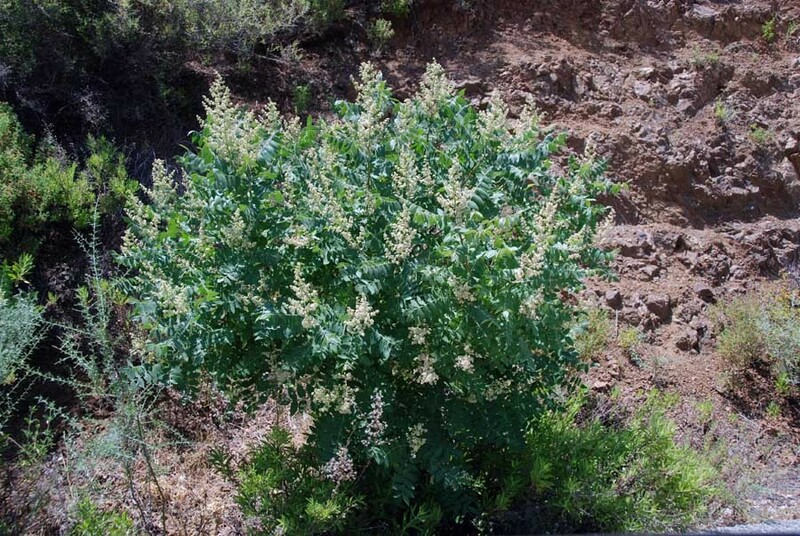 I stopped to write some notes in a little lay-by shaded by 20m-high Oriental alder (alnus orientalis) trees. It was absolutely baking hot. I got out and heard water running. 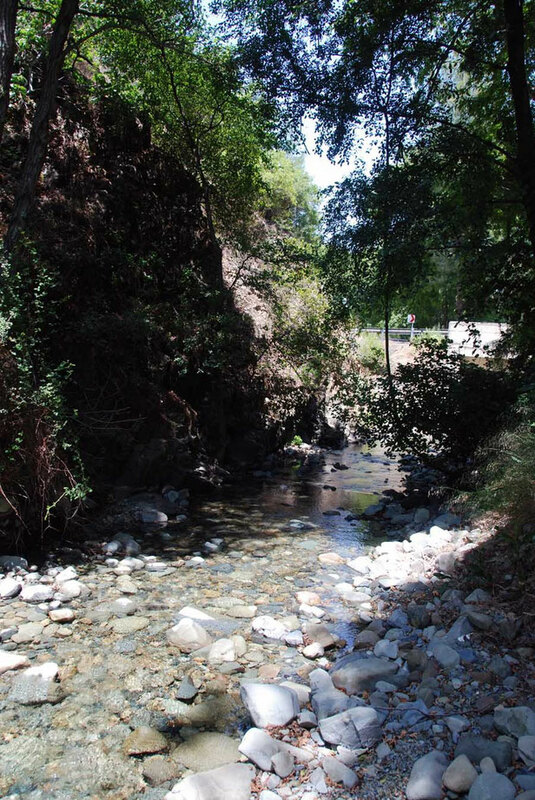 A bubbling stream - a rare sight indeed in Cyprus in June - was chugging by beneath the trees. Over an improvised bridge was a small market garden with beans, cucumber plants, olive and 'medlar' (loquat) trees. 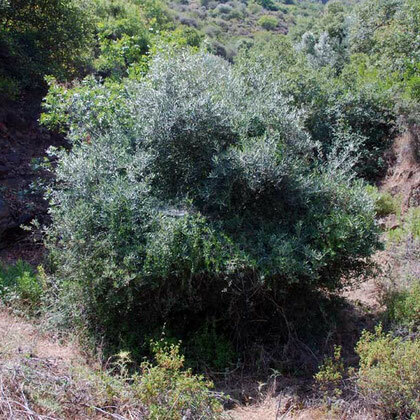 Birds sang, cicadas scraped and the air was full of the resinous smell of Brutia pine forest and the milky, sappy, peppery scent of fig leaves cooking in the sun. A steady gentle breeze pushed the hot air around. Χeros valley. 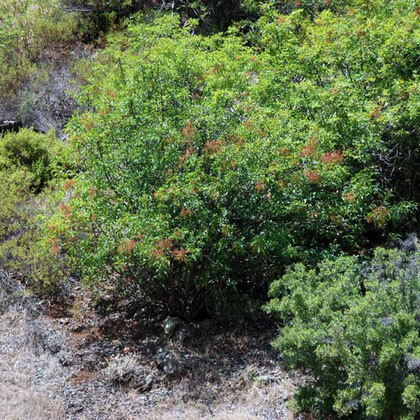 The vegetation is sparse on the red, treacherously-steep shaley earth. 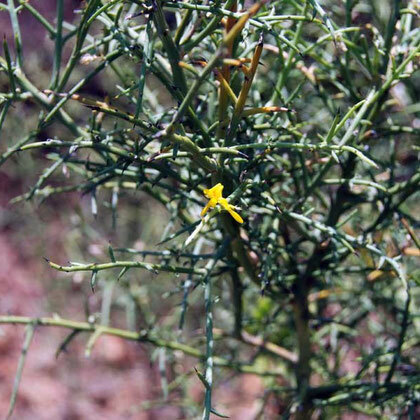 The air was full to bursting with the smell of the pines, the cistus (that smells slightly of a kind of fleshy, heady, new gloss paint) and the blue-ash-grey of the curry-type plants with their yellow flowers. 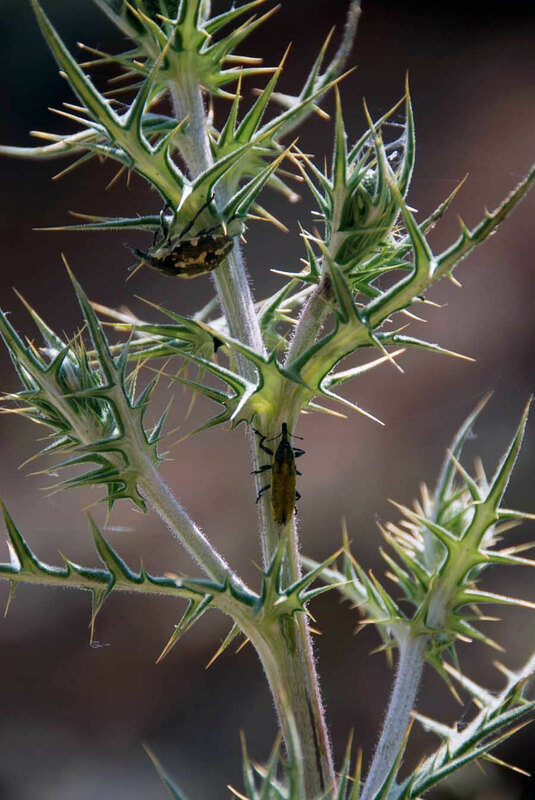 There are wild olives, thorn bushes, thistles with big seed heads and two bugs on each plant, a eucalypt-looking plant with white flowers that wilt away, two taller shrubs, a long-leaved and short-leaved cistus, a spiky broom - Cyprus Broom (Genista sphacelata) endemic to Cyprus , a tall Verbascum and a dwarf Sumac. 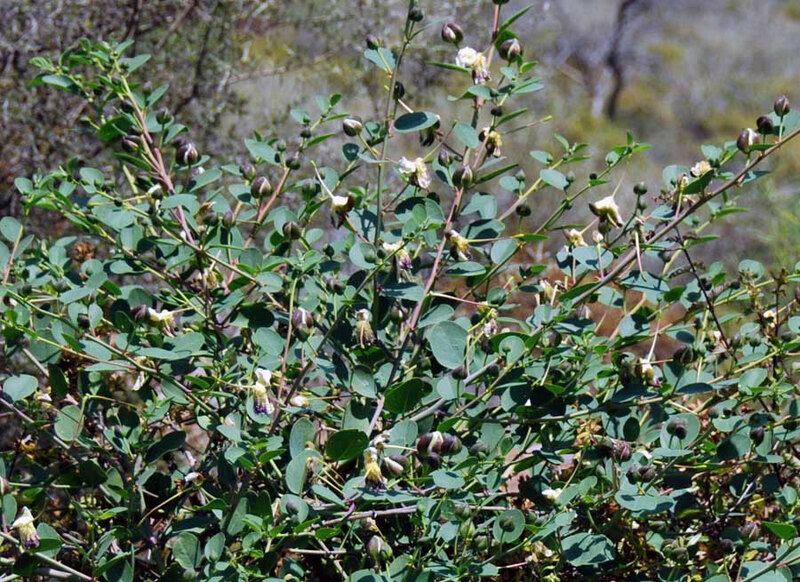 The 'eucalypt' turns out to be a wild Caper plant (capparis spinosa). We had come across it in a salad. 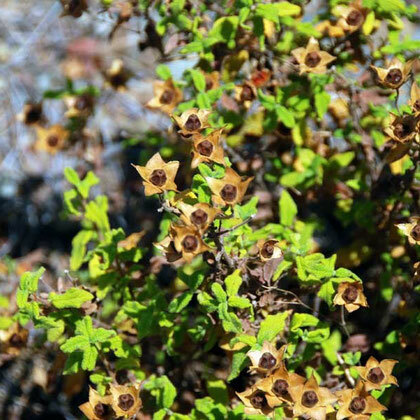 Its buds, tender stems and fruit are pickled in salt, vinegar and olive oil to make a Cypriot appetiser (Sfikas, Wild Flowers of Cyprus). 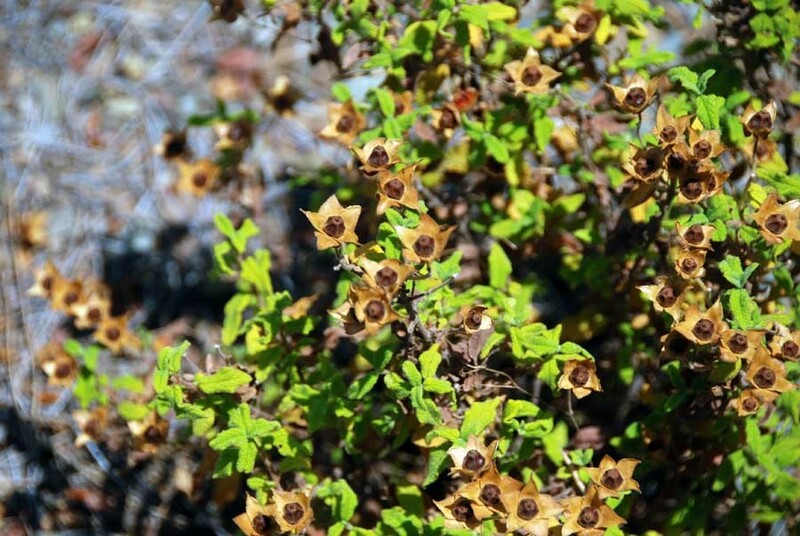 Sfikas calls it a 'wonder of nature' because it flowers in the hottest part of the year. 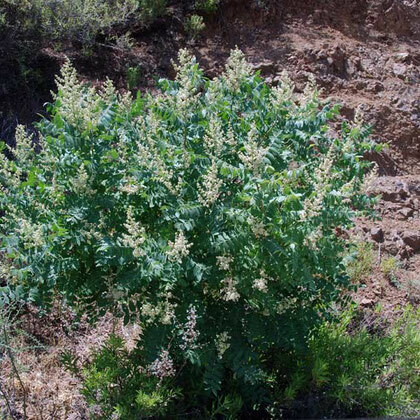 The Sumac variety (Rhus coriaria) grows in Cyprus and the dried fruits are used as a spicy addition to souvlaki. 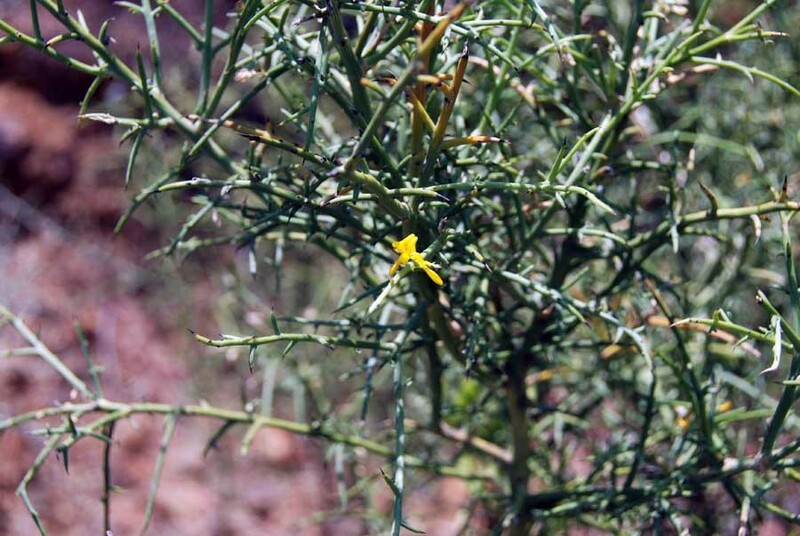 It is widely used in Middle Eastern cookery as a bitter spice. If the road to Kampos is not exactly crowded - I passed a couple of pick-ups ferrying mattresses and other goods- the road to Pyrgos is desolate. The driver of the one van I passed by, struggling up a steep grade, gave me a vigorous wave as if pleased to see a fellow traveller. There is no mobile reception in the valleys and not a house on the whole length of the road let alone a petrol station. 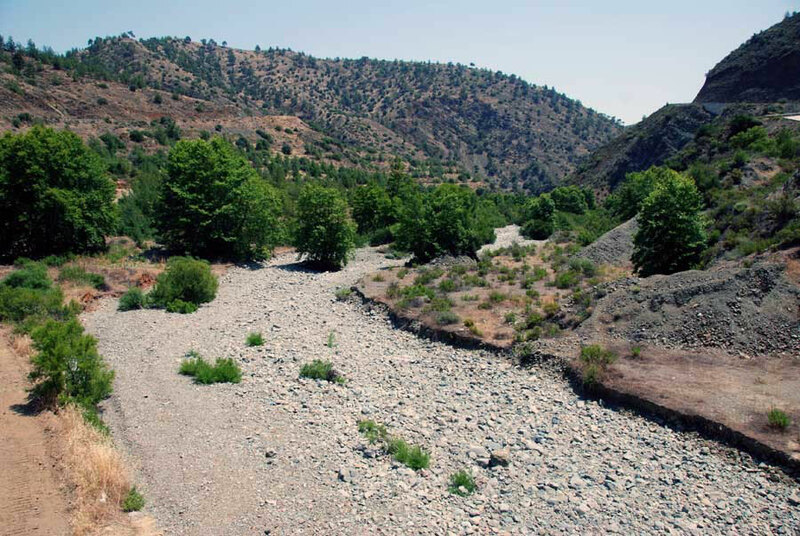 The heat kept building and road became ever more serpentine, being forced to take gigantic loops to avoid the valley floors, climb the spurs and keep on the right side of the Buffer Zone. 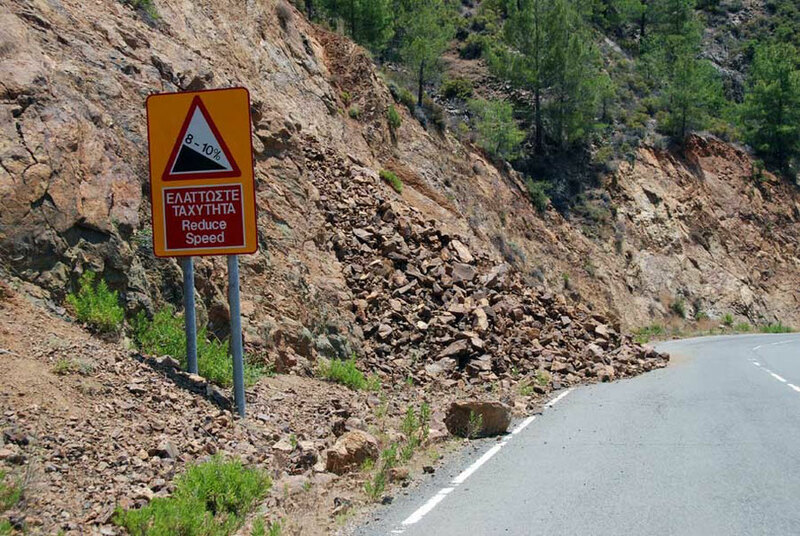 Rockfalls are common and the size and quantity of rock on the road is salutory. 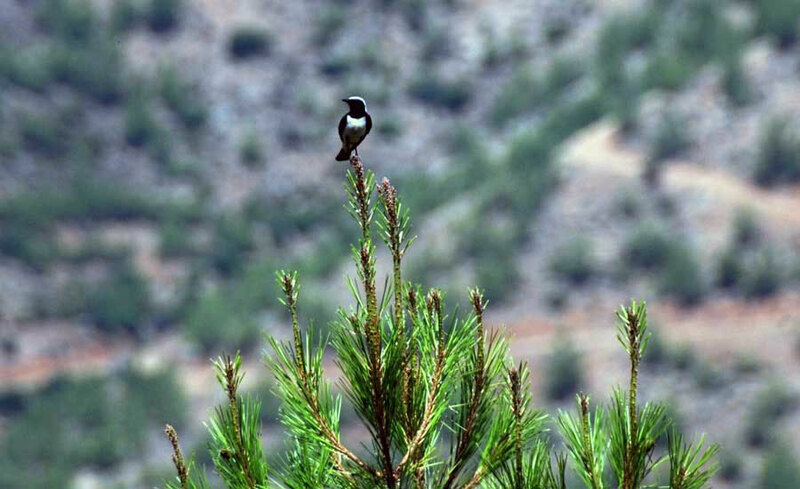 In fact, the only human presence I was aware of was hidden in the barbed-wire enclosures of Greek Cypriot military posts perched on the ridge spines and hidden in the valleys of these empty hills. At one point I passed a group of guys with machinery that looked like a pile-driver way up on a ridge top. On one of the long valley loops the road swoops down to the end of the valley to cross the rapidly flowing Limnitis river. I stopped and scrambled down the bank to stand in the cool water and soak my boiling head. Signs had warned of the possible presence of Cyprus' mooflon (Ovis aries orientalis ophion) but I was disappointed not to see one. 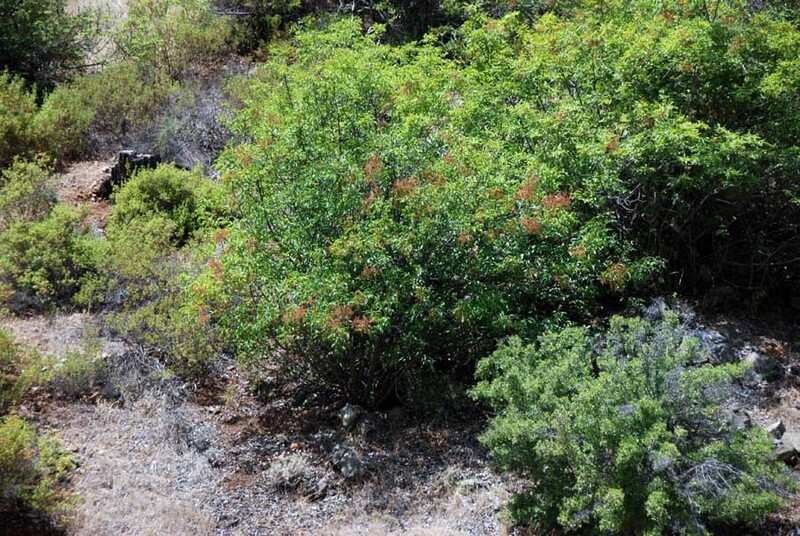 You can see a photo of the Cypriot endemic sub-species here. 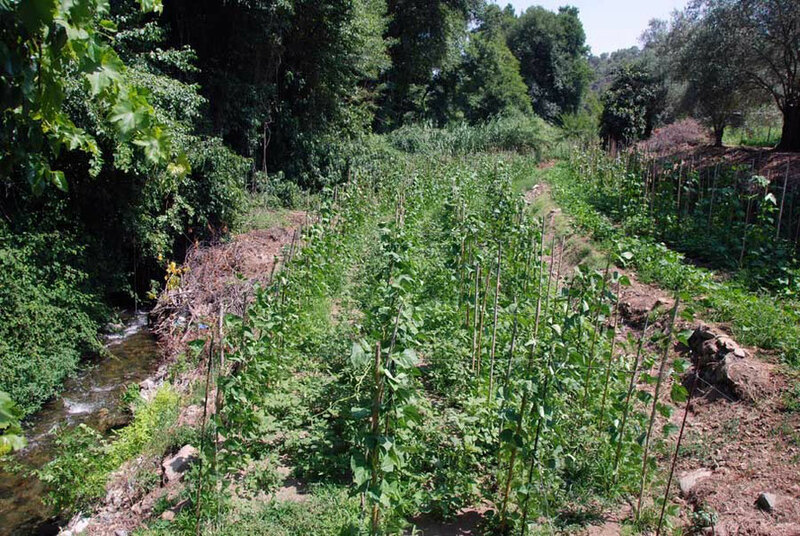 But the freshness under the tall Oriental Alders and a type of willow with pods was a relief from the relentless sun. I climbed back into the car refreshed and continued on my way. The air con was off because it was draining too much power from the little Fiesta's engine on the long climbs and endless corners. 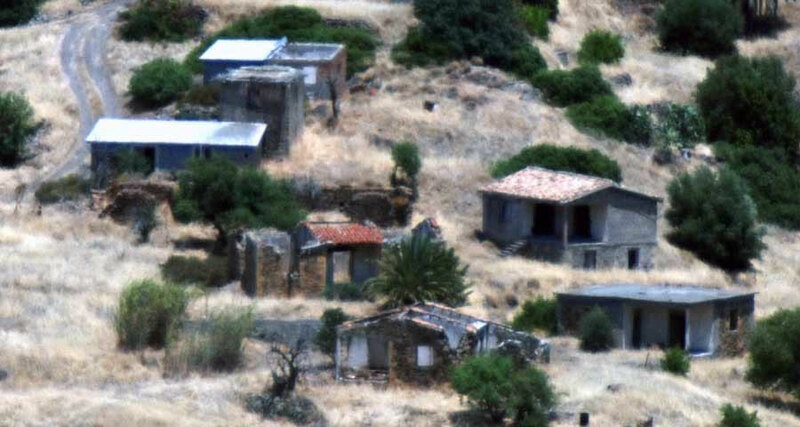 The 1974 war and the geography of the front line practically cut Pyrgos off from the rest of southern Cyprus. The Pyrgos road I was driving had been much improved to make the passage to Nicosia in winter possible, if a bit daunting. 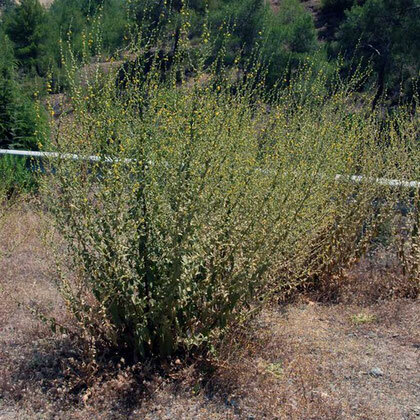 It had also been improved to accelerate response times along the Green Line to the numerous UNFICYP and Greek Cypriot military posts, signed by black on yellow boards pointing along wilderness tracks. 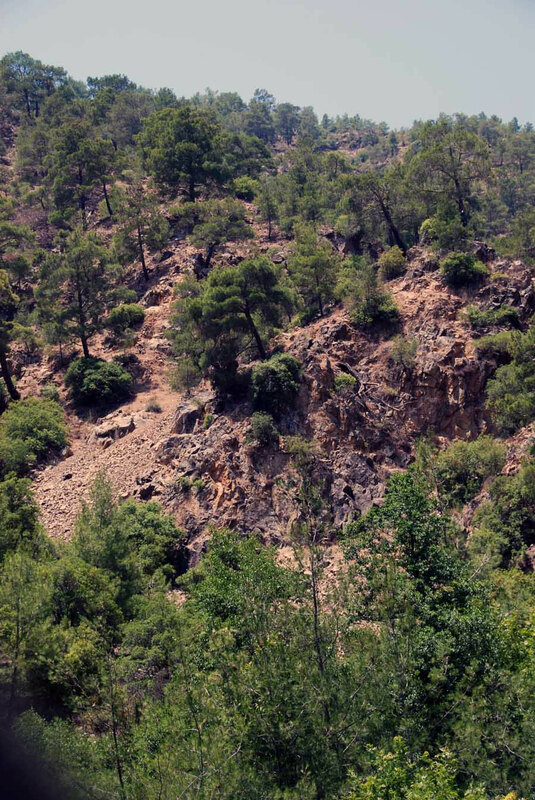 I could imagine it would become a very intimidating drive during one of the Troodos mountains' spectacular thunder storms with their accompanying torrential rains loosening rocks and shale on the perilous slopes. Still, the waitress at the hotel had told me that the road was a single track earth road with limited passing places. It wasn't but although the road was completely empty it would only take one bit of bad luck to meet a pick-up or military or UN vehicle careening around a blind corner out in the middle of the road. In the final valley before the last climb there is a big army post and then on the road itself a sign indicating the presence of the Buffer Zone by the roadside. On the far ridge is a tiny UNFICYP look-out post. Further along the valley is an abandoned collection of huts - perhaps even a village. On the far ridge is a tiny UNFICYP look-out post. 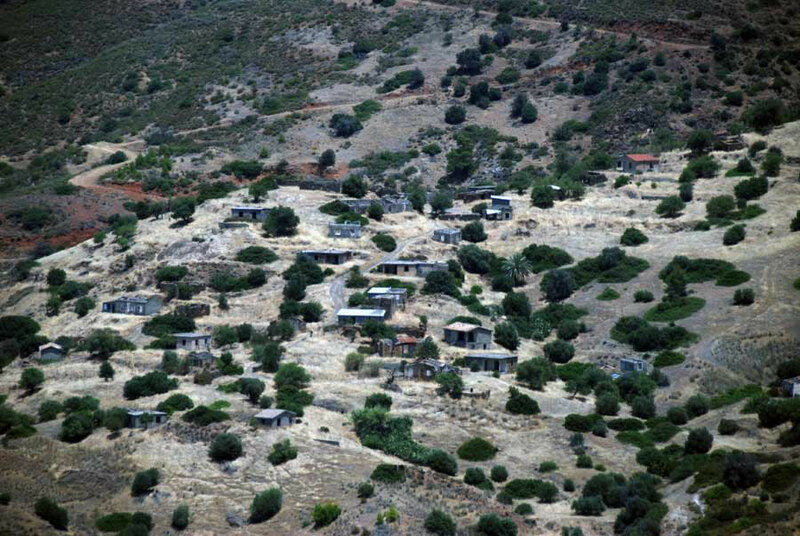 This village is Selemani (Agios Ioannis) and was home to 142 Turkish Cypriots in 1960. All the Turkish inhabitants of Süleyman/Süleymaniye were displaced in 1964. 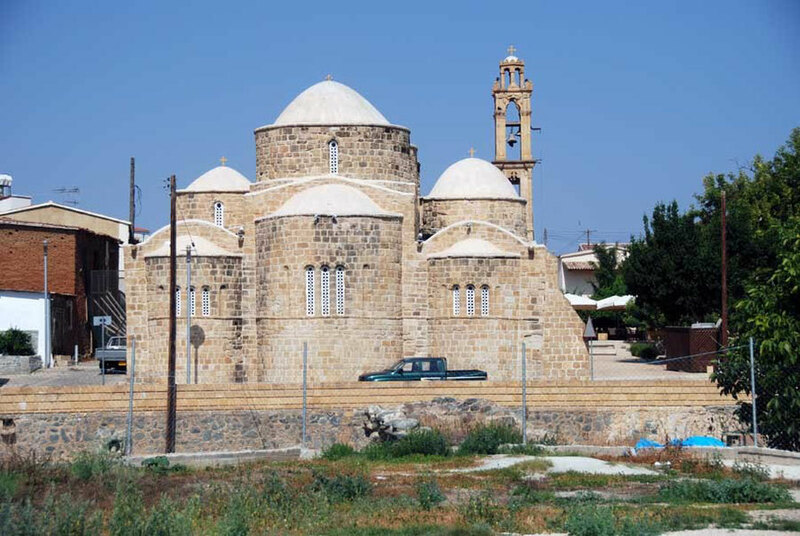 The village was evacuated by UNFICYP in August 1964 when the area was under attack by General Grivas and his Greek Cypriot National Guard during the Tylliria Battle. 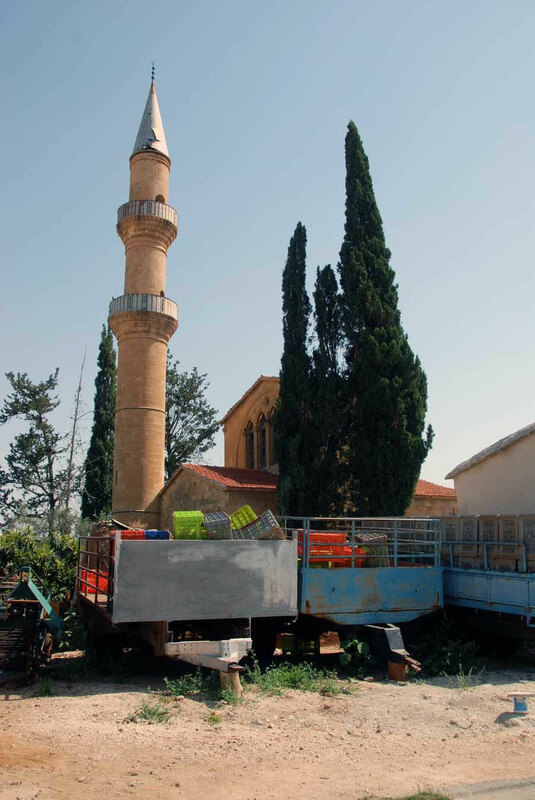 Most of the Turkish Cypriots of Selemani/Süleymaniye sought refuge in the Turkish Cypriot enclaves of Kokkina/Erenköy(050) and Limnitis/Yeşilırmak(061). 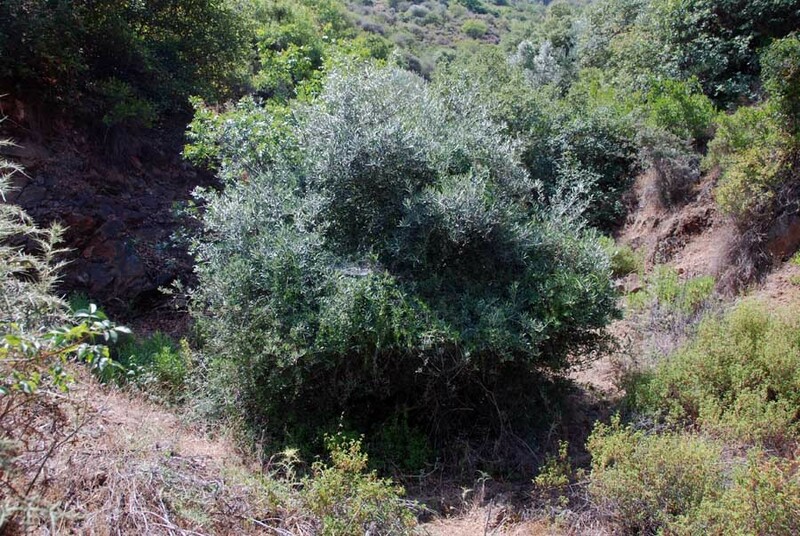 They remained there until 1976 when they were once again moved to the Turkish-controlled part of the island, to the villages of Potamos tou Kambou/Yedidalga(090), Xeros, Karavostasi/Gemilonağı(045) and Yialousa(205) in the Karpasia/Karpaz peninsula. 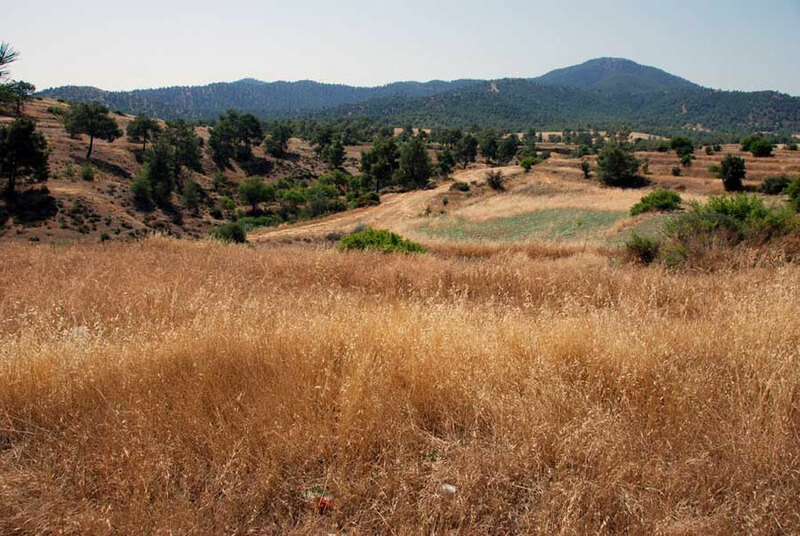 Some chose to settle in Limnitis/Yeşilırmak(061), only four kilometers away from their actual village, and where some also had relatives. Further along the valley is the abandoned village of Selemani/Süleymaniye (June, 2013). It hardly needs restating that many Greek Cypriots (between 170,000 and 200,000) were expelled or left Turkish occupied Cyprus in 1974-5. I carried on my way past some goat sheds and down the long final hill into Pyrgos. I drove through the village, which was somnolent under the early afternoon sun, and followed signs for the beach. The stones and sand between car and shore would have taken the skin off my feet and I hobbled in flip flops to the waters edge and threw myself into the cooling waters of the sparkling, empty sea. Refreshed I drove up to the old medieval look-out that stands between the village and the sea. Although the village seemed sleepy it looked more prosperous from up here. 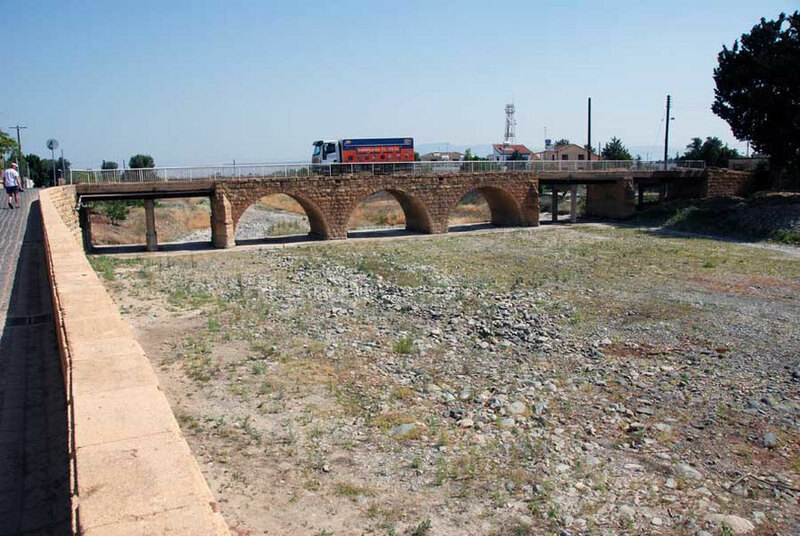 The new crossing at nearby Limnitis should in theory reduce the drive time to Nicosia from three hours to one and bring in more weekend visitors. Although it was mightily hot there was a sea breeze and the air felt fresh. I dreaded to think what the heat was like back in Nicosia as it sweltered on its dusty plain.